The kingdom of Cambodia, formally known as Kampuchea and Phnom Penh is the capital city. Cambodia is the successor state of the once powerful Hindu and Buddhist Khmer Empire, which ruled most of the Indochinese Peninsula between the eleventh and fourteenth centuries. Most Cambodians are Theravada Buddhists of Khmer extraction, but the country also has a substantial number of predominantly Muslim, as well as ethnic Chinese, Vietnamese and small animist hill tribes. Cambodia’s main industries are garments and tourism. Cambodia’s economy is a free market economy and is a low income country. Despite recent progress, the Cambodian economy continues to suffer from the effects of decades of civil war, internal strife and rampant corruption. The per capita income is rapidly increasing, but is low compared with other countries in the region. Most rural households depend on agriculture and its related sub-sectors. Rice, fish, timber, garments and rubber are Cambodia’s major exports, and the China, Indonesia, Japan, Malaysia, Singapore, Thailand and United States are its major export partners. Most Cambodians consider themselves to be Khmers, descendants of the Angkor Empire that extended over much of Southeast Asia and reached its zenith between the 10th and 13th centuries. Attacks by the Thai and Cham (from present-day Vietnam) weakened the empire ushering in a long period of decline. The king placed the country under French protection in 1863. Cambodia became part of French Indochina in 1887. Following Japanese occupation in World War II, Cambodia gained full independence from France in 1953. In April 1975, after a five-year struggle, Communist Khmer Rouge forces captured Phnom Penh and evacuated all cities and towns. At least 1.5 million Cambodians died from execution, forced hardships, or starvation during the Khmer Rouge regime under Pol Pot. A December 1978 Vietnamese invasion drove the Khmer Rouge into the countryside, began a 10-year Vietnamese occupation, and touched off almost 13 years of civil war. The 1991 Paris Peace Accords mandated democratic elections and a ceasefire, which was not fully respected by the Khmer Rouge. UN-sponsored elections in 1993 helped restore some semblance of normalcy under a coalition government. Factional fighting in 1997 ended the first coalition government, but a second round of national elections in 1998 led to the formation of another coalition government and renewed political stability. The remaining elements of the Khmer Rouge surrendered in early 1999. Some of the remaining Khmer Rouge leaders are awaiting trial by an UN-sponsored tribunal for crimes against humanity. Elections in July 2003 were relatively peaceful, but it took one year of negotiations between contending political parties before a coalition government was formed. In 1999, the first full year of peace in 30 years, the government made progress on economic reforms. The US and Cambodia signed a Bilateral Textile Agreement, which gave Cambodia a guaranteed quota of US textile imports and established a bonus for improving working conditions and enforcing Cambodian labor laws and international labor standards in the industry. From 2001 to 2004, the economy grew at an average rate of 6.4%, driven largely by an expansion in the garment sector and tourism. With the January 2005 expiration of a WTO Agreement on Textiles and Clothing, Cambodia-based textile producers were forced to compete directly with lower-priced producing countries such as China and India. Better-than-expected garment sector performance led to more than 13% growth in 2006. Faced with the possibility that its vibrant garment industry, with more than 200,000 jobs, could be in serious danger, the Cambodian government has committed itself to a policy of continued support for high labor standards in an attempt to maintain favor with buyers. The tourism industry continues to grow rapidly, with foreign visitors surpassing 1 million per year beginning in 2005. In 2005, exploitable oil and natural gas deposits were found beneath Cambodia’s territorial waters, representing a new revenue stream for the government once commercial extraction begins in the coming years. Mining also is attracting significant investor interest, particularly in the northeastern parts of the country. The long-term development of the economy remains a daunting challenge. The Cambodian government is working with bilateral and multilateral donors, including the World Bank and IMF, to address the country’s many pressing needs. The most distinctive geographical feature of Cambodia is the lacustrine plain, formed by the inundations of the Tonle Sap (Great Lake), measuring about 2,590 square kilometers during the dry season and expanding to about 24,605 square kilometers during the rainy season. This densely populated plain, which is devoted to wet rice cultivation, is the heartland of Cambodia. Most (about 75%) of the country lies at elevations of less than 100 meters above sea level, the exceptions being the Cardamom Mountains and their southeast extension the Dâmrei Mountains. The highest elevation of Cambodia is Phnom Aoral, near Pursat in the centre of the country, at 1,813 meters. The country experiences the heaviest precipitation from September to October with the driest period occurring from January to February. It has two distinct seasons. The rainy season, which runs from May to October, can see temperatures rise up to 40 °C around April and is generally accompanied with high humidity. The dry season lasts from November to April when temperatures can drop to 22 °C. Khmer culture, as developed and spread by the Khmer empire, has distinctive styles of dance, architecture and sculpture, which have strongly influenced neighboring Laos and Thailand. Angkor Wat (Angkor means “city” and Wat “temple”) is the best preserved example of Khmer architecture from the Angkorian era and hundreds of other temples have been discovered in and around the region. Bonn Om Teuk (Festival of Boat Racing), the annual boat rowing contest, is the most attended Cambodian national festival. Held at the end of the rainy season when the Mekong River begins to sink back to its normal levels allowing the Tonle Sap River to reverse flow, approximately 10% of Cambodia’s population attends this event each year to play games, give thanks to the moon, watch fireworks, and attend the boat race in a carnival-type atmosphere. Rice, as in other South East Asian countries, is the staple grain, while fish from the Mekong and Tonle Sap also form an important part of the diet. Overall, the cuisine of Cambodia is similar to that of its Southeast Asian neighbors. The cuisine is relatively unknown to the world compared to that of its neighbors Thailand and Vietnam and similar to other Southeast Asia cuisines. The constitution of Cambodia now promulgates free compulsory education for nine years, guaranteeing the universal right to basic quality education. The Cambodian education system is heavily decentralized, with three levels of government – central, provincial and district – responsible for its management. The Ministry of Education, Youth and Sports is responsible for establishing national policies and guidelines. At the central level, the Ministry of Education, Youth and Sport (MOEYS) has overall responsibility for establishing national policies and curriculum guidelines. Some tertiary institutions and vocational and technical secondary education institutions are under the governance of other technical ministries (Ministry of Agriculture, Health, Labor, etc.…). The other two levels are the provincial and district administrations. The MOEYS in the future will not only formulate the national policies but also the budget for all provinces, and will ensure that all local educational authorities spend their budgets and implement educational development projects within the national policy framework and budget allocation. The formal educational structure consists of six years of primary school (grades 1–6), three years of lower secondary school (grades 7–9), and three years of upper secondary school (grades 10–12). Higher education is available at the International University, Pannasasstra University, University of Cambodia, Royal University of Phnom Penh, the Royal Agricultural University, the Royal University of Fine Arts, the Faculty of Medicine, the Faculty of Law and Economics, the Faculty of Business (National Institute of Management), the Institute of Technology of Cambodia (formerly the Higher Technical Institute of Khmer-Soviet Friendship), and the Maharishi Vedic University (an Australian-funded institution in rural Prey Veng Province). Private education exists at all levels of the education system. In primary and secondary education, private schools have been opened by ethnic minority communities as well as for the children of the relatively small wealthy expatriate community residing in Cambodia. Private higher education is available at Norton University and at a number of other institutions, such as Regent College. Also, there is a flourishing industry, especially in Phnom Penh, in unregulated private schools that offer students instruction in foreign languages and computer skills. All kinds of privates schools are allowed to operate according to the curriculum development approved by the Ministry of Education, Youth and Sport. While Cambodia is developing it provides many lessons for Myanmar. Notable issues include development in education, politics, and governance and their relationship to NGOs. Much funding has been pouring into Cambodia in recent years and this has spurred many development projects—many of which could be applied to Myanmar. 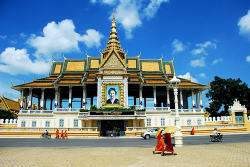 For the most part, Phnom Penh is an inexpensive place to visit. Accommodations can be as cheap as US$2.00 per day until you find permanent lodging, and you can feed yourself for about US $2-3 per day. If you want to travel out of the capital you’ll need to spend more, transport can be a major expense. The entrance fee at Angkor Wat is approximately US $20.00 The US dollar can be used everywhere. The Thai Baht is also widely accepted. ATMs are rare, but slowly increasing.